We all constantly negotiate with our colleagues, our bosses, our grad students, and with our partners and other family members. WICB is presenting two activities at the ASCB|EMBO Meeting in December that offer insights on how to negotiate for what you need. “Navigating Negotiation in Science” will be the topic of our Panel and Networking Reception presented in partnership with the Committee for Postdocs and Students on Monday, December 10, from 7:15–8:45 pm. The event features a panel of experts sharing advice and answering your questions on negotiation approaches. The panel will be followed by a “meet and greet” networking reception. Last year we had a highly successful and lively discussion on resiliency in science. “Let’s Make a Deal! Negotiating for Success” will be the topic of our WICB Mentoring Theater held Tuesday, December 11, from 10:45 am–noon. ASCB Thespians will perform brief skits that use satire and humor to demonstrate negotiation skills. Before the skits we will be honoring our three WICB awardees (see recipients below). We welcome meeting attendees to join us to honor the awardees and enjoy the skits. At the ASCB|EMBO Meeting we will again offer our “Career Discussion and Mentoring Roundtables” for which we now partner with other ASCB committees. Roundtables, led by experts, are a forum for questions and discussions on issues of importance to cell biologists at various stages of their careers, with each table focusing on one of more than 30 specific topics. Topics include but are not limited to Career Transitions, Jobs in Biotech, Dual Careers, and Strategies for Obtaining a Postdoc. Roundtables will occur on two days—Sunday, December 9, and Monday, December 10—from 1:00 pm–2:00 pm in the Learning Center. Information on each of these events is included in the ASCB meeting website, https://ascb-embo2018.ascb.org. And we also celebrate recipients of our WICB Childcare Awards, which provide financial help to attend the meeting for parents who are grad students, postdocs, or junior faculty and are presenting their science at the meeting. Applications for Childcare Awards are linked to the WICB webpage and are due annually right after the second deadline for abstract submissions. The Childcare Awards are made possible with support from the Springer Nature Publishing Group. Sophie Dumont, an associate professor in the Department of Cell and Tissue Biology at the University of California, San Francisco (UCSF), is the recipient of the 2018 Junior Award for Excellence in Research. This award recognizes newly independent, early-career scientists within seven years of their first appointment who show significant potential for making scientific contributions. Dumont bridges biophysics and cell biology to address fundamental questions on how chromosomes accurately segregate during cell division. Her group uses physical and molecular tools together with imaging to probe the mechanics of the mammalian spindle and kinetochore in live cells. 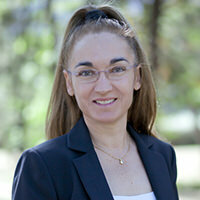 Dumont acquired expertise in biophysics during her PhD research with Carlos Bustamante at the University of California, Berkeley, probing enzyme-substrate mechanochemistry at the single-molecule level. She then moved her physical thinking to the cellular level, studying chromosome segregation as a postdoctoral fellow with Tim Mitchison at Harvard Medical School. She further developed this research direction as an independent investigator. Her work is generating new insights into how the spindle and kinetochore generate and respond to force to robustly segregate chromosomes. Elizabeth Chen, a professor in the Department of Molecular Biology at the University of Texas Southwestern Medical Center (UTSW), is this year’s recipient of the Mid-Career Award for Excellence in Research. WICB added the Mid-Career Award in 2013 to recognize women investigators who have held an independent position for 7 to 15 years. Chen exemplifies the award’s recognition of exceptional scientific and leadership contributions to cell biology in this critical career period between junior and senior stages, a period not typically celebrated with awards. Chen’s research program addresses questions of cell–cell fusion by investigating mechanisms across scales from molecules to cells to tissues in situ, the latter focused on myoblasts in Drosophila. By showing that cell fusion is an asymmetric, actin-driven process coordinated between partnering cells and revealing a biophysical interplay at the fusogenic synapse that involves both pushing and resisting forces of adjacent cells, her research has challenged existing paradigms. Her work is providing new insights that can be applied to stem cell–based therapies for tissue regeneration and repair. Chen received her PhD in Developmental Biology at Stanford University under the direction of Bruce Baker and completed her postdoctoral fellowship at UTSW working with Eric Olson, where she used genetic screens with Drosophila to identify evolutionarily conserved proteins that promote myoblast fusion. Chen began her independent career as an assistant professor in 2002 at Johns Hopkins University, and moved to UTSW in 2016. As noted by Olson, her nominator, Chen has distinguished herself by applying an interdisciplinary approach to a traditionally genetics-dominated research field. Olson and supporting references also highlight her leadership roles in graduate and postdoctoral training, organizing scientific meetings, and advisory boards. 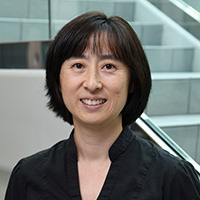 During her career Chen has received many honors and awards, with recent recognitions as an American Heart Association National Established Investigator and an HHMI Faculty Scholar. Eva Nogales, professor in the Molecular and Cell Biology Department at University of California, Berkeley (UC Berkeley), receives the WICB Sandra K. Masur Senior Leadership Award, which recognizes a woman or man with outstanding scientific achievements combined with a strong record of leadership and fostering the careers of more junior investigators. She began her independent career in 1998 at UC Berkeley and has been an HHMI investigator since 2000. In recognition of her early promise, she received the WICB Junior Award for Excellence in Research in 2005. Nogales is noted for her outstanding work in structural and cell biology, including her pioneering and innovative use of cryo-EM to resolve the structure of microtubules and microtubule interacting proteins as well as transcription and DNA replication machineries. This work was celebrated in 2016, when she received the Keith R. Porter Award. Her exceptional level of productivity, with more than 180 publications, has given us breakthrough discoveries on the architecture, functional states, and regulatory interactions of macromolecular assemblies. 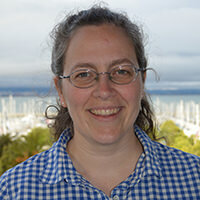 As noted by her nominator, Matt Welch at UC Berkeley, Nogales also has a strong leadership record in training junior investigators, heading the Biophysics Graduate Program and chairing the Undergraduate Affairs Committee at UC Berkeley, as well as serving on councils and meeting organizing committees for ASCB, the Biophysical Society, and Gordon Conferences. Her former postdocs wrote with great appreciation of Nogales’ outstanding mentoring and nurturing of junior investigators by optimizing their success in their career trajectories. In fact, she is usually seen at the ASCB|EMBO Annual Meeting surrounded by highly motivated students asking questions. We are delighted that this award coincides with Nogales being elected 2020 ASCB President. 1Powell K (2016). Sophie Dumont: Mastering the uncanny mechanics of living systems. J Cell Biol 212, 744–745.